PORTLAND, Ore. — Teachers across Oregon say they are seeing outbursts and disruptive behavior from students at an unprecedented rate and the alarming trend has caused many of them to question if they can continue to provide a safe learning environment. 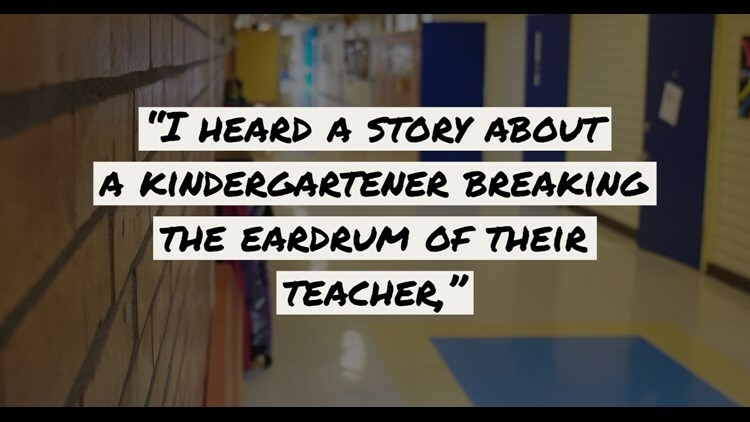 Teachers describe verbal, physical and sometimes violent outbursts in elementary schools. They say the incidents aren’t limited to classrooms focused on students with special needs but affect all classrooms. KGW recently gathered eight elementary school teachers to hear their stories about disruptive behavior. All eight described the problem as reaching crisis level. The outbursts from students are so commonplace that kids don’t go home and talk about it anymore,” explained first-grade teacher Melinda Ryan. Ryan was one of the teachers who joined KGW for a frank conversation about classroom disruptions. They came from the Portland, Beaverton, Hillsboro, Gladstone and North Clackamas school districts. “Generally, we’re unable to teach because there is so much behavior sometimes from the morning until the end of the day,” said fourth and fifth-grade teacher Cindy Honma. They talked for nearly an hour, describing the intense meltdowns happening in their classrooms. “Literal screaming. They are screaming for help literally. Sometimes that comes out in suicide threats, death threats,” said first-grade teacher Kristin Bassaloff. Almost every teacher described seeing students throw furniture. “They are throwing furniture, they are running through the building, going to the office and throwing chairs at windows and it’s really intense,” said Ryan. The incidents sometimes lead to students or teachers getting hurt. It’s difficult to quantify how much the problem of disruptive behavior has grown because most districts don’t keep uniform data about student outbursts. However, data looking at teacher injuries offers some insight about the scope of the issue. 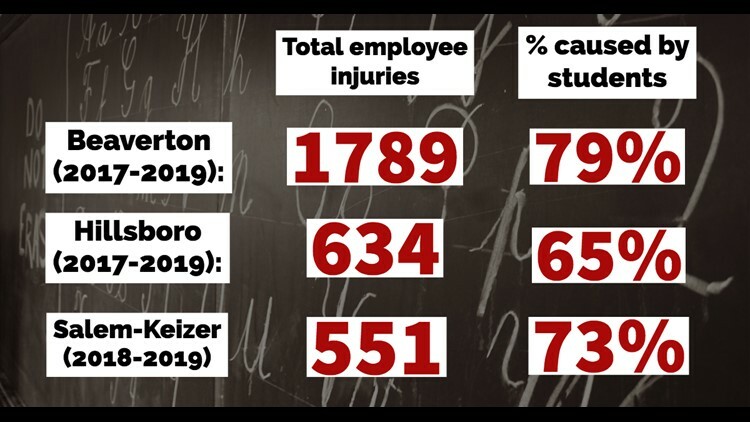 Numbers obtained by KGW show that in the Beaverton School District there were 1,789 incidents where teachers were injured on the job during the 2017-2018 and 2018-2019 school years. Of those injuries, 72 percent were caused by students. In the Hillsboro School District, there were 634 incidents in the last two years where teachers were injured on the job. Of those injuries, 65 percent were caused by students. The Salem-Keizer School District just started this year tracking teacher injuries caused by students. They reported 551 total incidents this school year where a teacher was injured. Of those, 404 of the injuries was caused by a student. KGW also asked Portland Public Schools for similar numbers from the 2017-2018 and 2018-2019 school years. The district could only provide the numbers for incidents where workers were injured and students were involved. The district reported 121 such incidents in 2017-2018 and 72 incidents this school year. “I don’t think the students want to hurt someone. They just don’t know how to communicate their feelings,” said Traci Chelf, a teacher with 19 years of experience. Chelf is a currently a “teacher on special assignment,” or TOSA, in the Beaverton School District. In that role, she’s often sent to help in classrooms where students have had an outburst. “A room clear is where a student is so dysregulated that your students are not safe,” kindergarten teacher Torrie Dowdy. School districts use the word “dysregulated” to describe a student who has lost control of their emotions. State law restricts when a teacher can physically restrain students. As a result, districts have told teachers to handle these incidents using methods like classroom clears. 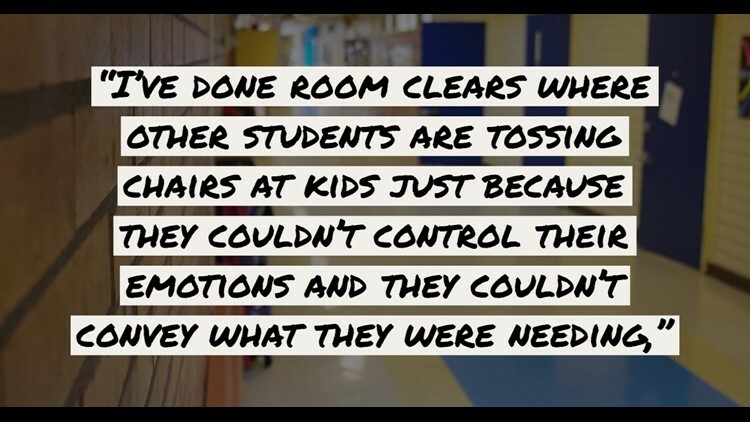 “I’ve done room clears where other students are tossing chairs at kids just because they couldn’t control their emotions and they couldn’t convey what they were needing,” she said. Classroom clears interrupt educational time, which can add up when they happen repeatedly over time. Educators also described having to “herd” students. That’s where they guide a child back to safety without touching them, even if that student runs out of the classroom or building. 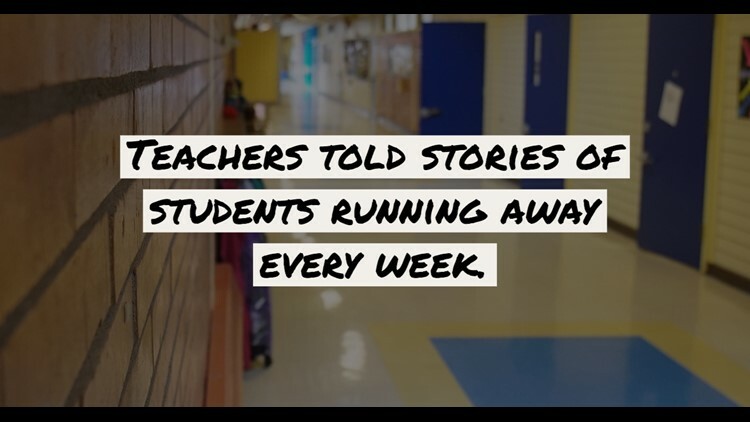 Teachers told stories of students running away every week. “They see it as a game. For a lot of these children, now you’re playing chase with them. Instead of having to learn, they get to run around the location of their choice,” said Perez. State representative Barbara Smith Warner, House chair of the Joint Committee on Student Success, heard similar stories from teachers during a statewide listening tour. “You have teachers who say I am afraid to grab a kid who is about to run out into the street. That is the way we are being told we are supposed to deal with this and that’s ridiculous,” said Smith Warner. The 14-member committee visited 49 schools over the last year. Former committee member and state representative Carl Wilson heard from parents concerned with how these incidents are being handled. “Why is the disruptive child not pulled from the classroom, why is that child left in the classroom and others all others are pulled out?” said Wilson. Former Hillsboro School Board member Janeen SoClassllman, who represents House District 30, heard stories from teachers in her area. Representative Susan McLain, a former teacher of 40 years, said she couldn’t imagine dealing with incidents like this when she was an educator. “There have been injuries of teachers, I personally have a friend who is an aid and has been an aid in special-ed classrooms for close to 20 years she’s been injured twice in the last five years,” said McLain. State representative and joint committee member Brian Clem heard what he called “horror stories” from his own elementary school-age daughter. “She said, 'Oh yeah a first grader yelled,' and I don’t want to say it, horrible obscenities, as bad as you can imagine, she said the first grader yelled them for an hour and no one could do anything except just wait,” said Clem. He was shocked when he heard why the teachers were clearing out rooms and herding students. Teachers told him they felt restricted by a recent Oregon law that only allows teachers to physically restrain students in limited situations. 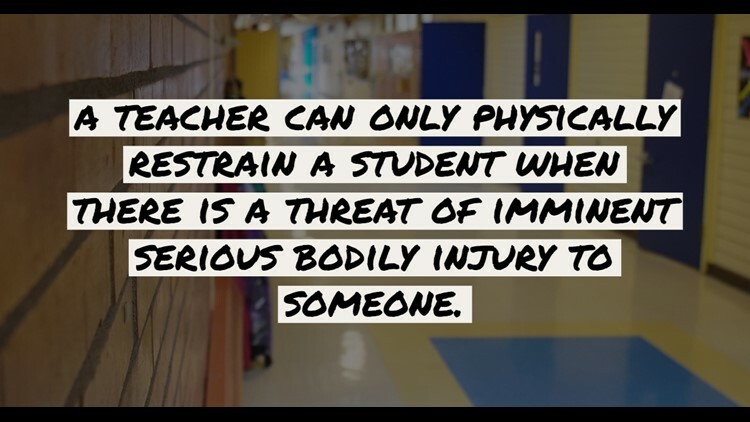 House Bill 2939, which passed in 2011 and was amended in 2013, says a teacher can only physically restrain a student when there is a threat of imminent serious bodily injury to someone. The law was passed in response to an increased number of special needs students being restrained or put in isolation rooms. “We passed legislation to respond to a problem and in responding to that problem we inadvertently create another problem. Let’s get the pendulum back to a good place,” said Smith Warner. Clem is co-sponsoring a bill that would allow educators to physically assist students without fear of getting sued. “They don’t have to be restrained and grabbed but physically assisted to the principal’s office, physically assisted to the time out area,” said Clem. “What they mean is that teachers can physically assist students to help them perform routine school tasks such as putting a hand on back of student to guide them down the hallway, hand over hand to assist with drawing, and in case of emergency to provide protective physical intervention to keep kids safe,” wrote ODE spokesman Mark Siegel in an email. He did not respond to our question asking why so many teachers in multiple districts across the state were told they can’t touch students and must resort to other methods like herding. Teachers, they need more adults in the classroom and the money to fund those jobs, even if that alone won’t solve this problem. “We have such little minds to meld and we need more support. We need highly qualified people in those positions, which are often not incentivized positions,” said Bassaloff. Teachers we spoke with said schools need more full-time counselors to help work with these students before these disruptive incidents occur. Why the increase in disruptive behavior? There are several theories on why disruptive incidents are on the rise in Oregon classrooms but no in-depth research on what’s causing it. Teachers say more trauma at home and less support in schools are the most obvious factors. State Representative Janeen Sollman says issues like homelessness is causing deep distress in these children. “These are young children who are experiencing homelessness, they have health issues whether it’s physical or mental, there are poverty situations they may not know where their next meal is going to be served,” said Sollman. There’s also a theory that these kids currently in elementary school have been raised with a screen in their hand. Some studies suggest technology physically changes a child’s brain, namely the frontal lobe that regulates emotions. 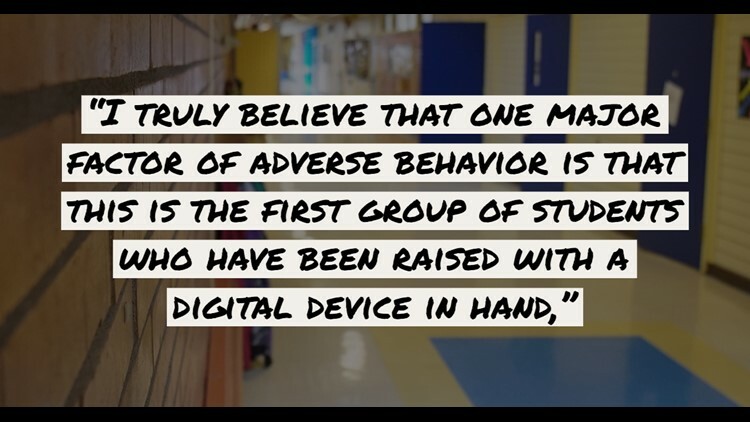 “I truly believe that one major factor of adverse behavior is that this is the first group of students who have been raised with a digital device in hand,” said Chelf. But the reality is, no one knows for sure why this is happening. KGW has interviewed dozens of teachers and school administrators about an increase in verbal, physical and sometimes violent disruptions in Oregon and Southwest Washington classrooms. We’ve received emails from hundreds of additional teachers who tell similar stories. Many teachers say they don’t have the proper training, support or resources to deal with this disruptive behavior. 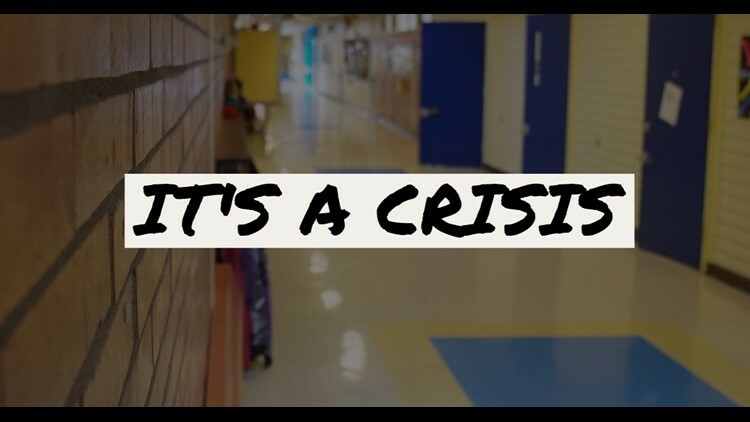 The teachers don’t blame the kids, pointing out that many students have suffered trauma in their lives; however, they say the current law makes it difficult to handle these incidents effectively. In many cases they are forced to clear all other students out of a classroom until a disruptive student can calm down. We will continue to tell these stories and push for solutions from lawmakers and school officials.